Pennsylvania State Sen. President Pro Tempore Joe Scarnati answers reporters’ questions in his Capitol office late Wednesday night. HARRISBURG — After a marathon day of negotiations Wednesday, Republican leaders in the Senate failed to push through a compromise on an emotionally charged bill aimed at helping older victims of clergy abuse gain the right to sue, leaving its fate in limbo as they wrapped up the last voting day of the legislative season. 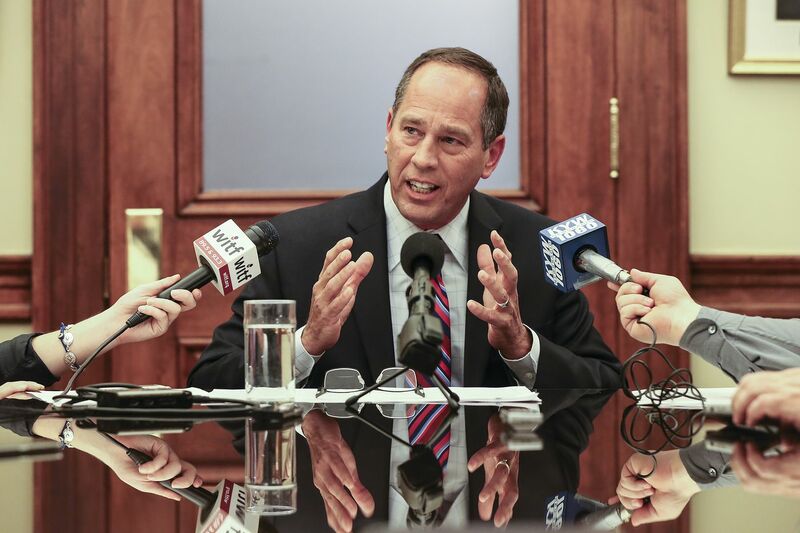 Senate President Pro Tempore Joe Scarnati (R., Jefferson) said at a press conference inside his office shortly after 11 p.m. that he had tried to gather support for a plan that he believed would help victims seek justice, but that no one would meet him half way. Catholic benefactor to Pa. senators: Stand with victims or their abusers? His plan would have allowed for a temporary reprieve in the statute of limitations so that older victims could sue their attackers — but not the institutions, such as the Catholic Church, that may have covered up the abuse. "We are at a standstill," he said. State Attorney General Josh Shapiro, whose office ran a sweeping grand jury investigation into clergy abuse in nearly every Roman Catholic diocese in the state, countered that Republican leaders in the Senate "just decided to quit to go home." "We made real progress in this battle," Shapiro said, adding: "And this is far from over." But the legislature does not have any more scheduled voting days in its two-year session, which ends next month. Though both chambers could add more days, it is unlikely, as many legislators are now returning to their districts to run reelection campaigns. As the day progressed Wednesday, many privately said that Scarnati appeared to be losing votes for his proposal, which was sharply condemned by victims, their advocates, Shapiro, Senate Democrats, and one of the House's top Republican leaders. Scarnati, at his press conference, downplayed any division in his chamber, saying his proposal would have been approved in the Senate. But he said he decided not run the bill because a top leader in the House said many in his chamber opposed it. Indeed, House Majority Leader Dave Reed (R., Indiana) had stood on the balcony overlooking the Capitol rotunda earlier in the day, and flanked by clergy abuse victims declared: "We will not accept that proposal." Reed said the House would not agree to a proposal that provides a window for victims to only sue their attackers but not the institutions that supervised them. Scarnati's plan also would have created a state-run compensation fund through which victims who are too old under the current law to file civil claims could access compensation. It is not clear who would have financed that fund, although the state's eight Catholic bishops have broadly supported the concept. Democrats in the Senate also did not mince words in expressing opposition to Scarnati's plan. Senate Minority Leader Jay Costa (D., Allegheny) said it was very similar to one that was pitched by lobbyists for the Catholic Church in recent days and weeks. "This is their solution, in my view. This is what they are looking to put into place," Costa said. Scarnati has been the most vocal and the most powerful opponent to a so-called window in the civil statute of limitations. Lobbyists for the Catholic Church and the insurance industry have also fiercely lobbied against any retroactive changes. Both have said such a retroactive change would deal a devastating financial blow. Victims and their supporters have said they believe the only just solution is to fully adopt a state grand jury's recommendations to offer a temporary reprieve in the civil statute of limitations to allow lawsuits against both abusers and institutions for two years. Currently, the law bars legal claims for sexual abuse from those older than 30, which would prohibit recovery of damages for decades-old acts like many of those described by a state grand jury report on clergy abuse in Catholic dioceses. Scarnati, at his press conference, said he had moved his position "significantly" over the last few weeks, but that "none of the other sides wanted to compromise." In a rare display of emotion, he said he had been "villainized in the press," called "undesirable" names and painted as someone who stands with pedophiles. "I'm the father of three children. I lost a child. And to say that I stand with pedophiles is insulting and it's disgusting," Scarnati said. Shapiro earlier in the day had called Scarnati's compromise plan "disgraceful." "A priest earns about $25,000 a year and will have no ability to pay for the mental-health counseling and the drug and alcohol counseling, the services that these victims need," said Shapiro, who came to the Capitol on Wednesday to meet with top senators. "The only entity that can help support these victims ironically is the institution that enabled the abuse, and they are exempt." Asked about the idea behind a victims compensation fund, Shapiro said: "The idea that you are going to let the Catholic Church define whether or not it participates and how much they are willing to put into a fund is a slap in the face to the victims … and it allows them to continue the cover-up, to continue to silence victims." Senate Majority Leader Jake Corman (R., Centre) said he would not comment when asked whether he supported the measure. He was noticeably absent from the press conference Scarnati held late Wednesday. Scarnati's proposal would have walked back his stated opposition to any reprieve in the statute of limitations. For years, he and others have said they believe any retroactive change in the law violates the remedies clause of the state Constitution, which has been interpreted by some lawyers and legal scholars as blocking any temporary exceptions to time limits. The debate over the civil window picked up intensity after the release in August of a grand jury report on Catholic clergy sexual abuse in Pennsylvania involving more than 1,000 victims over seven decades. The grand jurors who spent two years listening to evidence in the case made four policy recommendations. Key among them was eliminating the statute of limitations in future criminal cases involving child sexual abuse, and opening a two-year window so that victims who are too old under current law to file civil claims can have a chance to sue their attackers and the institutions that covered up the abuse. The GOP-controlled House of Representatives late last month passed legislation, championed by Rep. Mark Rozzi (D., Berks), a clergy-abuse victim himself, that included a provision for a two-year window. Victims and their advocates have crowded Capitol hallways and visited senators' offices in recent weeks to persuade them to follow the House's lead. What are other elected officials doing with their government-related texts and emails?